Meg Kuang and Shawn ChangMeg is a 3rd year Commerce student and Shawn is a 1st year Science student. We often ask: what does it really mean to lead? Studying at a leading institution like UBC, we’re surrounded by inspirational leaders and, above all, endless opportunities to step into impactful roles ourselves. 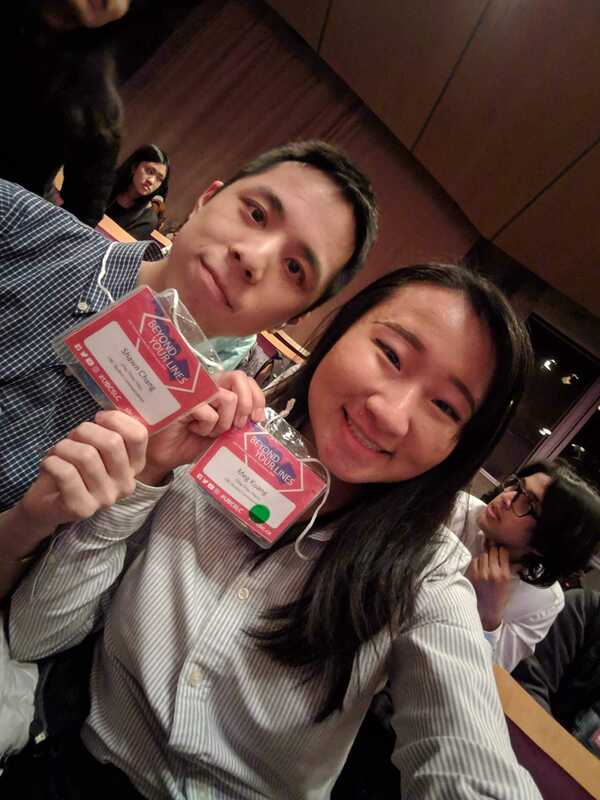 On January 12, we attended the UBC Student Leadership Conference 2019: Beyond Your Lines. The signature event is fuelled by the spark of leadership at UBC, bringing us all together to celebrate how we can step 'beyond our lines' and make a bigger impact. Offering dozens of experiential programs, among them workshops, discussion panels, and learning labs, the 2019 SLC has created a unique experience for us both and given new lenses to add to our—and everyone else’s—personal toolboxes of perspectives. Here’s a glimpse into our key takeaways! Meg learned how to lead—with teams, and with purpose. I spent my day at SLC participating in the Sustainability Design Challenge: a collaborative and friendly competition, where we were tasked with prototyping a project to increase sustainability awareness on campus. As a business student, I’m quite familiar with business case competitions with teams of, well, other business students. But the Design Challenge was different—with people from all different faculties, backgrounds, years, and interests, we all started off as strangers. Very different strangers. The brainstorming portion was challenging as it was hard to get on the same page...but soon, ideas began to spark. With our combined knowledge of residence life, technology, UBC buildings, and student motivations, we prototyped a project that would award points for proper waste-sorting...and we named it “Beyond Your Bins” (it was funny at the moment, I swear)! Despite the challenges, we leveraged our differences instead of throwing them aside. This made our solution unique, something that can’t be created by just one person, one mind. That’s the power of diverse teams—and to me, this is seen not just in competitions and group projects, but also in student-led initiatives, social groups, businesses, and almost all collaborative life events. Keeping an open-mind towards diverse perspectives is what sparks creativity and progress—two things I value the most. It may not start off easy, but working towards a common purpose is what gives diverse teams the synergy to achieve great things. Prior to attending SLC, I had envisioned “Beyond Your Lines” as simply a restating of “beyond your comfort zone”—but there was more to be learned. Our lines can mean boundaries that limit our full potentials, whether set by ourselves or expectations of others. “It’s not about HOW you go beyond your lines, it’s about WHY,” he said. What this means to me is that we should step beyond our comfort zones with purpose in mind—not just for the heck of doing so. What have you always wanted to do, but were too afraid to? And why? “Find something that makes you excited to get out of bed every day,” Jaelem suggested in his speech. As someone who recently underwent a period of passion-discovery, switching my major, and risking much of the progress I’ve made, chasing my “why” has kept me going. Despite the setbacks, my passion is as fiery as ever. This is what Jaelem meant by stepping beyond our lines with a concrete, enthusiastic, and unwavering “why”—and we can feel and use this power in everything we work towards. Shawn learned how to lead—with openness, and with awareness. While Meg progressed through the SLC Design Challenge, I followed a schedule of workshops and panel lectures under a specific stream: Pathways to Leadership. The workshop “Questions You Need to Ask” reminded me of the intimacy derivable from proposing questions that sought non-obvious, more thought-provoking answers, questions that make us open up. During this growth period as students, we consistently, by way of the university experience, confront the very questions that define who we are, who we want to be. Which major to choose? What kind of career? What to do after graduation? Maybe now is the time to, through feeling discomfort and uncertainty, figure out who we want to be and what we believe in. Asking personal, tough questions can sometimes make us uncomfortable. In this discomfort, we can learn to listen to different perspectives, see ourselves in one another. We recognize those who are facing discomfort, and can then stop by, check in, listen. The panel discussion “Stories of Self-Exploration” taught me that a topic capable of making someone uncomfortable is worth openly discussing. If someone around you has said something that made you uncomfortable, experiencing discomfort shows that you disagree, and hold something to be true to your identity and values. Near the day’s end, I reflected on my learnings and where I would go from there. The classroom setting provides fertile ground to be uncomfortable and offers me an opportunity to tear away from shyness and reach out for clarification, so I will, ever so often, raise my hand during lectures to ask a question. When planning for future events, I will promote universal accessibility by asking “Would anyone feel alienated?” and emphasizing the inclusion of everyone, regardless of ability, gender, orientation. I would, above all, carry with me the importance of always questioning why things are what they are: stereotypes, labels, and social constructs. Kim Katrin Milan, the closing keynote speaker and an activist for justice and inclusion, highlighted the value of asking questions—and recognizing discomfort, not only in ourselves but in others. When we place ourselves in others’ shoes, imagining our own wants, I realized, we unwittingly make ourselves the standard, despite our empathetic motivation. We therefore need to reach out, step up, and ask questions. No one should be left behind or unheard, I learned, and it is often more meaningful to choose the courage of going beyond our lines, whether it is prejudice or shyness, rather than the comfort of remaining behind them. When hearing the word “leader,” we may associate it with CEOs, student club presidents, or Justin Trudeau. But the truth is, anybody can be a leader—it doesn’t have to mean leading a company, a team, or a country. SLC gave us this refresher. During the ceremonies, we watched videos of UBC student leaders who, along with receiving the Faces of Today Awards, inspired us, motivated us, reminded us that we, too, are capable—when we step beyond our lines with purpose and openness, we become leaders in our own ways. We can see something unique about everyone and inspire one another to try something new, however uncertain we may be. Uncertainty makes us ask questions, which, in turn, are inventions of our curiosity, our courage, our chosen mindset for change-making. Welcome diverse ideas, work together, and direct your actions towards a purpose that makes your eyes light up. Reach out with questions and transparency, learn to be comfortable with being uncomfortable, and rethink the rigid social constructs that may not be, after all, so rigid. In Kim Katrin Milan’s words, “We can all be superheroes.” So start leading today!